At Dave and Amy English School, we develop our own materials. Why? Because materials for native speakers are often overly complicated for EFL students. Native speaker games are aimed at a market that is surrounded by English everyday. But an EFL student often studies English only once a week. For the EFL student, the vocabulary and grammar in these games can be overwhelming; reducing confidence and interest in English. 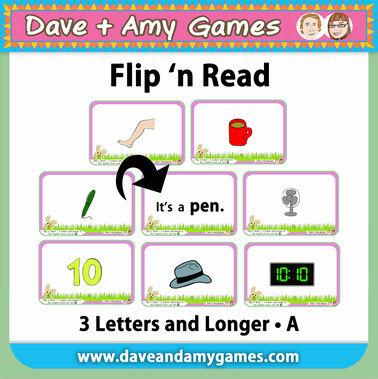 With Dave and Amy Games, we keep use vocabulary, grammar and questions and answers that a child would use. 2. Irrelevant vocabulary for EFL students: Do our students really need to know what a wheelbarrow is, what YEILD means? Materials for native speakers often have superfluous vocabulary for a child learning English once a week. At Dave and Amy Games, we use words that are EFL appropriate and child friendly. Teaching words like scooter, video game, grade, subject…. 3. A mixture of easy and difficult vocabulary. A game we bought in America has the words boy, caterpillar, frog. leaf, hat. The aim of the game is to read and match the word with the picture. This game is not good for beginners or higher levels. Beginners lose confidence trying to read the longer words. Higher levels find half the game too easy. At Dave and Amy Games, we begin easily and progress in difficulty. When a child goes from Flip 'n Read: ABC Phonics A to Flip 'n Read: ABC Phonics B, it is a gentle level up. The raise in difficulty is doable for the student. 4. Lots of empty spaces to pad out the text into very thick textbooks. These enlarged books take some time to finish. The My English Book and Me series (1 - 6) are simple, clear and packed with child friendly vocabulary. Students learn phonics, vocabulary, questions and answers accompanied by fun, clear images. We wasted lots of money buying texts and games from abroad. Hopefully, you don’t make the same mistakes we did. Did we miss any points?